Get help and advice from us! A Carer is someone who provides unpaid support to a family member, partner, child, friend or neighbour who may be ill, frail, elderly, have a disability or long-term health issue or have mental health issues – and who could not manage without this support. Carers do not necessarily live in the same home as the person they care for and may themselves be unwell, have a disability or long-term illness. If you look after someone who couldn’t manage without your help your first stop should be to contact Carers Trust 4all who are now providing carer support services in Herefordshire. Call them on 01432 663057. Their team (which includes some of our former staff – friendly, experienced and helpful!) can offer information, one-to-one advice and help with getting the support and services that are relevant to you. Here at Herefordshire Carers Support we are continuing to support local Carers groups, offer training opportunities, free counselling as well as trips and social events for Carers. Sign up for our email updates if you are a Carer – and you can become a member of HCS for free too! We aim to open up possibilities so that you can continue your caring responsibilities but also to take stock, meet others – and have some fun. Each Carer is individual and different, what helps one person may not help another but our activities will help you to explore ideas and think about what might help you. Herefordshire Carers Support exists to ensure that carers are universally recognised as fundamental to the communities in which they live and to ensure that there is a balance between their caring responsibilities and their lives outside their caring role. Who is a Carer? A carer doesn’t have to be someone who lives with the person they care for or be related to them. If you care for them, then you are a carer. If you are under the age of 18 and you help care for someone then the Young Carers Support will help you. There is a support network for parents and carers for children with additional needs which provides information and support. We also run a Carers Forum. by cancer? 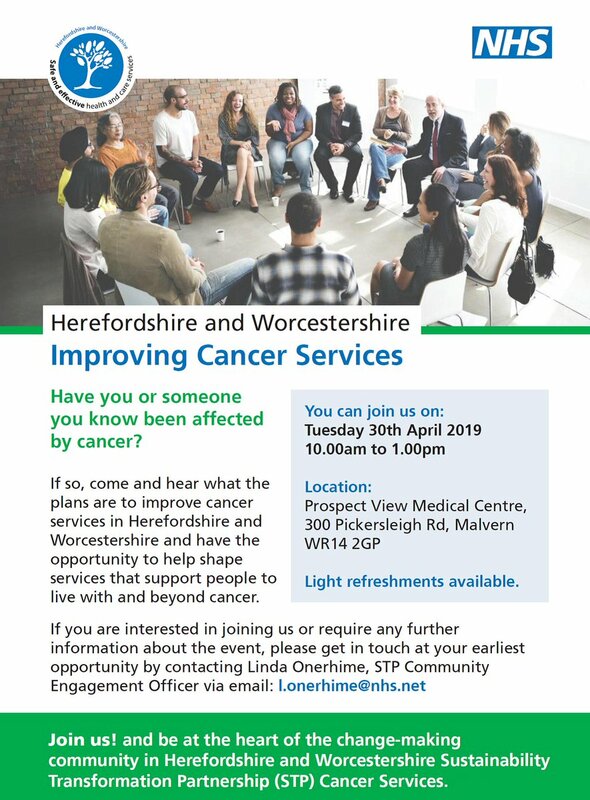 an event to get people in Herefordshire and Worcestershire to put in their views on cancer services. Tuesday 30th April 2019 10.00am to 1.00pm at Prospect View Medical Centre, 300 Pickersleigh Rd, Malvern WR14 2GP Light refreshments available. Contact Linda on l.onerhime@nhs.net to come! How do you rate your overall experience of Herefordshire Carers Support’s services? We are always looking for ways to improve our services for both Carers and Professionals. Please tell us about your experience with Herefordshire Carers Support by leaving your feedback. This will help us to ensure we are providing you with what you need.